Offer users a seamless outdoor-indoor wayfinding experience with smooth transitions from outside to inside a building. 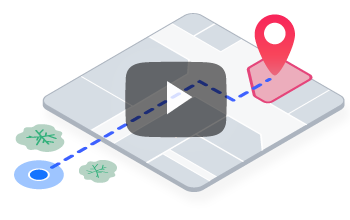 Jibestream’s extensible indoor mapping platform can guide users from their front door, to the closest parking spot, and right to their desired destination within a building. Whether you are traveling from home or between buildings, Jibestream enables you to provide true navigational continuity. Enhance the user experience by combining the power of GPS and IPS to enable blue-dot navigation. Build a seamless journey between outdoor and indoor environments for a better user experience. Superimpose Jibestream’s geospatially accurate maps on the world map to support fluid outdoor indoor navigation. Combine Jibestream maps with popular outdoor mapping solutions such as those provided by Google, Apple, and HERE. Extend the navigation experience to facilitate seamless travel from outdoor to indoor spaces with the Jibestream indoor mapping solutions.